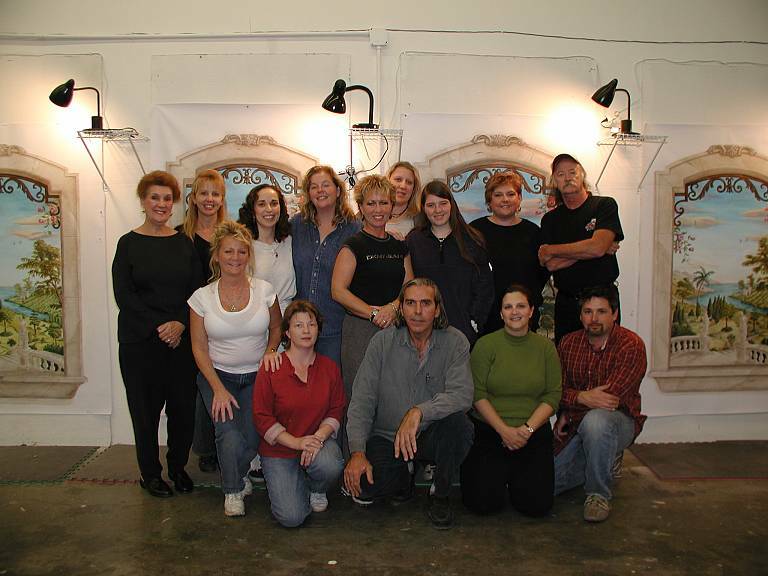 "Trompe L'oeil and Murals DVD Workshops"
Streaming & Download. or DVD's Workshop film in HD. 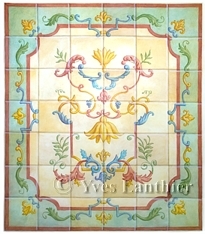 In this workshop, you will learn every step how to paint this beautiful "Trompe L'Oeil Tiles". Don't miss this opportunity! This will make a nice addition to your portfolio and give you extra techniques to expand your design creativity. Bean able of incorporating tiles work in your murals will certainly excite your client and give you the edge you need to succeed in your field. Trompe L'Oil Tiles DVD and Download Streaming Workshop small intro. DVD's video training film in HD also available in Blu-Ray format. 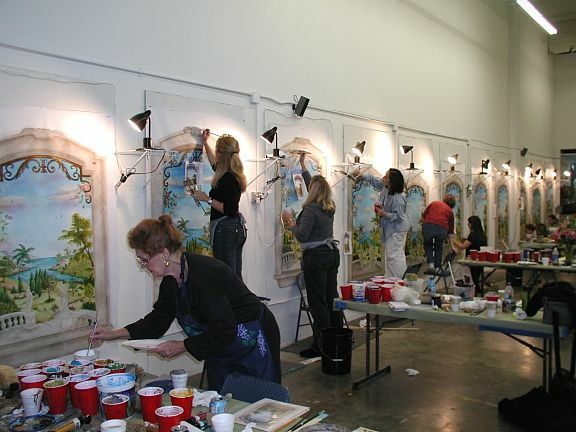 In this workshop, you will learn all there is to know about creating murals like the one in my book. "The Art of trompe L'Oeil Murals". Learn every step how to paint this beautiful trompe l'oeil window. Don't miss this opportunity! This will make the difference in your career between being just a craftsman or becoming a master in your field. Also included, one downloadable instructional CD containing list of material needed as well as larges sketches (PDF. files) that you can take to your office supply store for printing in large format or print to be use with your projector. If you prefer to buy a pre-sketched canvas (shown on the left) to do your workshop please click below. Window Trompe L'oeil B&W Sketched Canvas. "Click here to see a short step by step photo preview"
This workshop is for all aspiring fine artists professionals or beginners who want a sense of what it is like to create critical work. Learn all there is to know from Yves himself at the comfort of your home. A step by step instructions how to sketch, transfer and paint “Madonna with child from Michelangelo”. 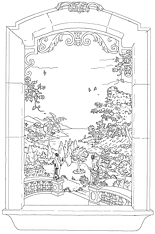 Size 44" x 44" mural; this workshop includes 2 DVD's (or 1 Blue-Ray) and a downloadable instructional CD listing of all you will need to accomplish this artwork. It is a must have in your collection if you are serious in becoming a professional Trompe L’Oeil artist. Note: There is no refund on any DVD or Blue-Ray order. 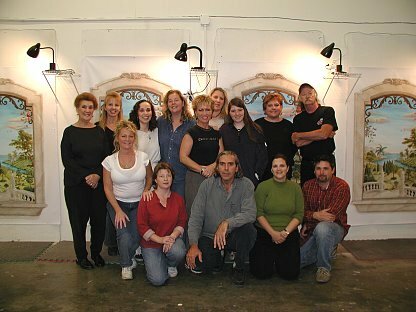 In Yves previous workshop students have learned every step how to paint this beautiful trompe l'oeil window. Yves personally teach all of his secret techniques needed. 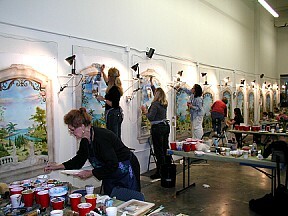 Students got a black and white sketch transferred on canvas (shown on the left) and where instructed step by step how to paint each element and magically transformed into the finish mural showed on the left. If you missed this opportunity! 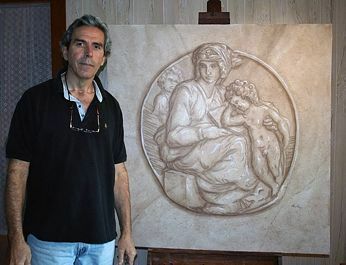 Don't miss Yves new workshop "Reviving The Ancient Trompe L'Oeil Tiles Techniques" coming up February and March 2015. Make the difference in your career between being just a craftsman or becoming a master in your field.